THE pub has probably never seen the like; certainly according to the Sunday Mail’s Charles Lavery, winner of the ‘Reporter of the year; title at the Scottish Press Awards on Thursday, but unable to collect the award in person as he was part of a boycott protesting against compulsory job cuts at his newspaper and sister title, the Daily Record. Instead of Lavery collecting the award, it came to him – at an ‘Alternative Scottish Press Awards’ being held in a pub around the corner from where the official event was taking place. 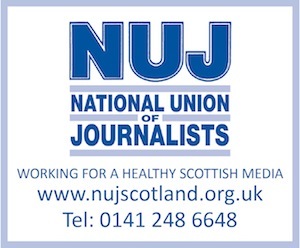 The boycott tied in with a three-day walkout of journalists at both the Sunday Mail and Daily Record. Lavery takes up the tale: “A small gathering had repaired to Denholm’s Bar, where we had our own wee bash in among the old men drinking their half pints and nips, and when news filtered through that I had won, my brother, Damien, asked for my press card and embarked on a mission to retrieve my award. “Step forward [one of the Press Awards organizers] Fiona Bell, who not only brought the gong to reception but insisted on accompanying my brother round the corner and straight into Denholm’s where she presented the award to rapturous if somewhat bemused applause from the locals.